, remotely controlled with any land-line or mobile phone. With a simple voice-call using any land-line or mobile phone a 230V consumer can be switched ON and OFF. Control commands (ON, OFF, …) are typed in over the phone keypad or send to the box via SMS. In general any switchable 230V consumer in household and office/shop from “A” likeÂ Aquarium Automatic Feeder to “S” likeÂ Shop Window Lighting and “T” likeÂ Time Switch are eligible â€“ there is no limits to imagination here. However, it is most important that whenever an electronic device is switched ON unattended, (time switches for example) it shows no harm during usual continuous operation. The outlet can be switched ON and OFF by using any telephone or mobile phone key tones (DTMF), via SMS or Data-Call (= CSD). In addition, for example a reset (OFF / wait 10 seconds / ON) can be triggered. If the command SMS contains a ”*” (at any position) an acknowledgement SMS to the sender is sent after the execution of the command. For protection against sabotage and ”jokesters” commands are only accepted by authorised callers! The caller/sender of an SMS can only be authorised if correct password (stored in the phone book) of the SIM card is provided. The password must be given either way by voice call (typing the password) and when sending a SMS (password must be in the SMS text). The outlet consists of a connector housing with safety plug (CEE 714) contacts. Load up to 2000W can be switched and the box can also manually be switched ON and OFF by push-button at the bottom of the box. The required GSM antenna is screwed (stubby type antenna) directly to the SMA antenna jack. For problematic receiving areas (e.g. basement, interior), it is also possible and recommended to connect an external GSM antenna with SMA connector. A selection of optimised GSM antennas (magnetic mount, disk, etc.) are offered in our shop. The electrical outlet with integrated mobile phone â€“ the mobile phone with integrated outlet, remotely controlled with any landline of mobile phone. With the SwitchBox-wireless, Model GSM and a simple voice-call using any landline or mobile phone a 230V consumer can be switched ON and OFF. Control commands (ON, OFF, …) are typed in over the phone keypad or send to the box via SMS. are eligible â€“ there is no limits to imagination here. However, it is most important that whenever an electronic device is switched ON unattended, (time switches for example) it shows no harm during usual continuous operation. 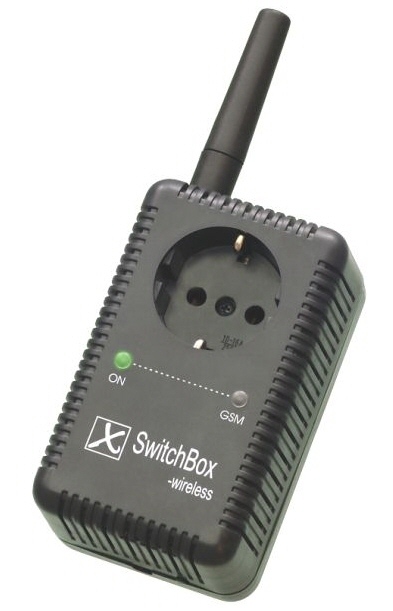 What are the main features of the SwitchBox-GSM? The SwitchBox-GSM can be switched ON and OFF by using any telephone or mobile phone key tones (DTMF), via SMS or Data-Call (= CSD). In addition, for example a reset (OFF / wait 10 seconds / ON) can be triggered. The SwitchBox-GSM consists of a connector housing with safety plug (CEE 714) contacts. Load up to 2000W can be switched and the box can also manually be switched ON and OFF by pushbutton at the bottom of the box. Manufacturing and Product Development “Made in Germany“, i.e. unlike many other products in computer equipment, we provide a long time availability. how much would be the cost of the whole kit? how much would be the cost? They offer serval different versions on different price levels.